Are you looking for a place by the water to enjoy the view? Perhaps you’d like to cool off on a warm Blue Ridge day. The Blowing Rock area features lots of places where water and related activities are the main attraction. 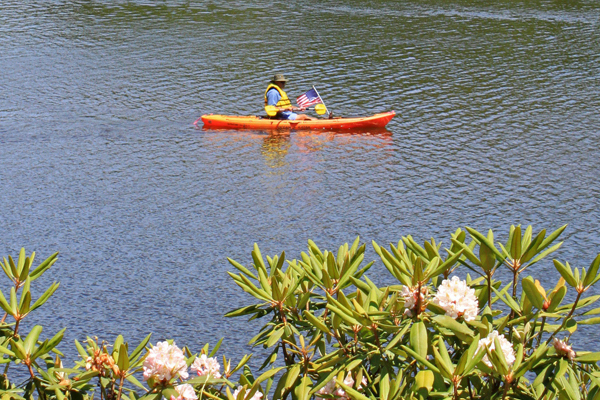 Canoeing and kayaking are very popular on Price Lake, the largest body of water on the Blue Ridge Parkway. Price Lake is only 5 miles from downtown Blowing Rock and is accessible right off the Parkway with a convenient parking area. Bring your own watercraft or rent one at the lake during the summer months. 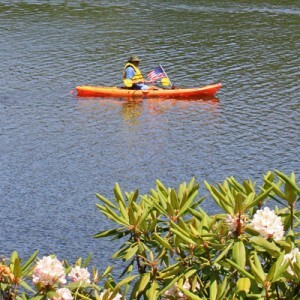 The lake also features a wonderful trail around the perimeter, surrounded by rhododendron thickets and deciduous trees. If you’re looking for a stunning view, visit the lake on a calm day when the mirror surface reflects Grandfather Mountain, the sky, and surrounding trees. It’s especially stunning during the fall foliage season. If you have your own watercraft, the New River is excellent for canoeing and kayaking as well- easy access is available along Railroad Grade Road in Todd and at New River State Park. Fishing can also be enjoyed at Price Lake and Bass Lake, as well as Trout Lake and the Watauga and Middle Fork Rivers. Our rivers and lakes are scenic, clean, and protected, and home to some of the best fishing. Relax by the water waiting for rainbow, brown, or brook trout, smallmouth bass, or bluegill. If you don’t have a NC fishing license, stop by the Village Hardware store on Green Street in Blowing Rock. See our fishing page for more information on local spots! For a dip in cool mountain water, one of the most popular family watering holes is along the Watauga River in nearby Valle Crucis. Visit the Valle Crucis Community Park on Broadstone Road to get easy access to the river. Here, you can enjoy some calm spots in the river that are perfect for swimming, wading, and relaxing on the rocks. The Boone Fork River is also a fantastic spot, and home to Hebron Falls, a well-known watering hole. Boone Fork River runs through the Julian Price Park on the Blue Ridge Parkway. Access the falls and great swimming spots via the moderate Boone Fork Trail- Hebron Falls is about a mile and a half in. The trailhead is at the Julian Price Picnic Area, which is complete with picnic tables and grills. You might also choose to skip the hike and enjoy the waterway in the picnic area. Either way, the park is a perfect location for a day of fun. Don’t forget your sunscreen! You may also want to consider bringing some shoes that you can wear in the water- the waterways in the area often have rocky bottoms. And while you’re there if you ask nicely, some locals might give you some great tips on where to find some of the more secluded spots!